We are proud of our many alumni from both our undergraduate and graduate programs. Economics alumni are a highly successful group of individuals working in a variety of different industries throughout the world. 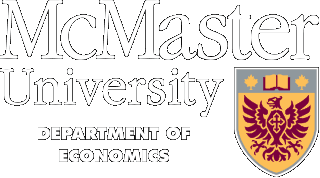 McMaster’s economics program is one of the best in Canada. Current faculty members are leading researchers in all major areas of economics and former economics undergraduates at Mac have gone on to outstanding careers in academics, law, finance, politics and industry. The Department includes faculty experts in microeconomics, macroeconomics, econometrics, experimental, health, international, labour, monetary, population, and public economics. Much of their research is applied to policy issues and utilizes advanced quantitative techniques. The strength of our programs is the quality of our faculty and of our research facilities. We have a strong research focus, winning awards and honours on the quality and impact of our research. Our teaching excellence has been recognized through teaching awards for high-quality classroom teaching and excellence in thesis supervision. Economics PhD student Nadine Chami, is currently completing an internship at the United Nations Economic and Social Commission for Western Asia (ESCWA) in Beirut, Lebanon. Atif Kubursi, Economics professor emeritus and a member of the McMaster Centre for Climate Change took part in a panel discussion at the youth conference for the Cities in Action: Bay Area Climate Change Summit 2019. The Department of Economics will host our annual level two orientation/degree planning event next Wednesday, March 27th. The BA in Honours Economics program is a four-level program that offers the challenge of more advanced work in economics. Honours BA Specialist Option stream provides the same, solid grounding in Economics as the Honours BA stream, with a minimal but highly specific differentiation. The Specialist Option requires an additional econometrics course that is necessary preparation for econometrics courses to be taken in MA in Economics programs. Economics can be combined with programs in the Faculty of Social Sciences and the Faculty of Humanities. This program provides the students with a solid foundation in computer science and exposure to the field of economics thereby opening up major opportunities for economist with a programming background. For the motivated student, the honours economics and mathematics program gives the benefits of two cultures and two distinct modes of thought: an important aspect in developing critical thinking and in today's job market. The BA in Economics program is a 3-year program designed to provide a general education, with an emphasis on the skills and knowledge required to understand the economy. Although it is not intended to prepare students for specific careers, the degree continues to be attractive to a wide range of employers. Students enrolled in a four- or five-level program in another subject may pursue a minor in economics. The Masters of Arts in Economics (MA) is a one-year program that provides a thorough grounding in modern economics, blending both theoretical and empirical methods. Graduates of the program normally pursue one of two career tracks. One track is immediate placement in a position as an economic analyst. Graduates regularly take up positions in a variety of public- and private-sector organizations. A second track is advanced study of economics, usually at the PhD level. The Masters of Economic Policy (MAEP) is a one-year program that provides a thorough grounding in modern economics, blending both theoretical and empirical methods.